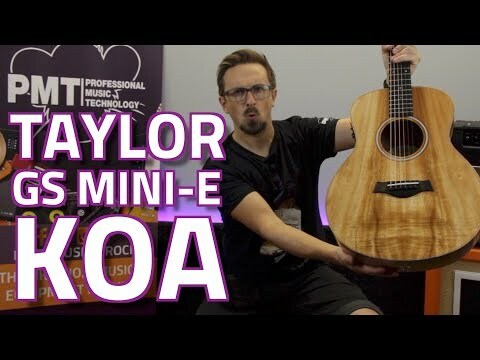 Taylor GS Mini-E Koa Electro Acoustic Guitar This gorgeous Hawaiian Koa edition of the best-selling Taylor GS Mini-E is the perfect way to s.. This gorgeous Hawaiian Koa edition of the best-selling Taylor GS Mini-E is the perfect way to stand out from the crowd, as well as adding a unique tonal character to your acoustic sound. Crafted as part of a limited run of premium GS Mini models, these won't be around for long, so get one whilst you can! Over the past 5 years, the GS Mini-E has become one of the best selling travel parlour acoustic guitars of all time, and is hugely popular with travelling musicians, songwriters or for anyone who needs a smaller body shape for a more comfortable fit. The all-Koa hardwood body on this model adds a shimmer and chime to the upper end of the tone scale, so a great choice for finger pickers and more melodic musical styles. The Taylor NT neck is built from a continuous piece of wood that supports the ebony fretboard all the way up to the 19th fret, which holds true over time and prevents your guitar from going out of tune for longer. The GS Mini-E's smaller 23.5" scale length and downscaled body shape is dervied from Taylor's classic Grand Symphony body shape, but still manages to retain the rich, full tone of it's full sized predecessors. As standard, the Mini-E comes fitted with Taylor's proprietary ES-B electronic pickup system, perfect for plugging in for a live gig or practice at home with an acoustic amp. Other standard GS Mini appointments include an all-matte finish, 5mm dot fretboard inlays, a 3-ring rosette, and chrome tuners. 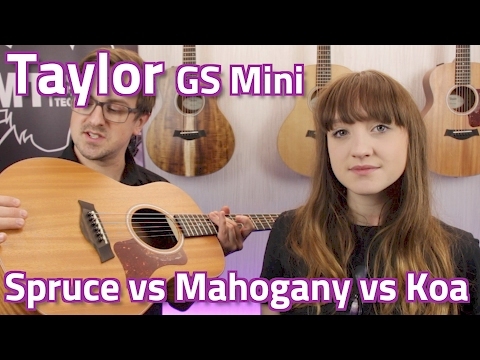 The guitar ships in a taylor-branded GS Mini hard bag for added protection compared to cheaper gig bags on the market. Get an amazing 12 year limited warranty on all new Taylor guitars. At PMT Online, we offer a two year warranty on this guitar as standard while Taylor offer an extra 10 years of warranty cover on top. Just purchase your guitar at PMT Online and you're covered by our 2 year warranty. Then, just register your new Taylor guitar over at TaylorGuitars.com/Register for an additional 10 years warranty with Taylor.